New for the AP® Latin Examination! 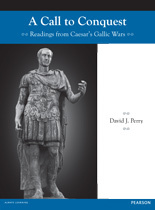 Written by David Perry, this new text introduces intermediate and advanced students to Caesar’s De Bello Gallico. 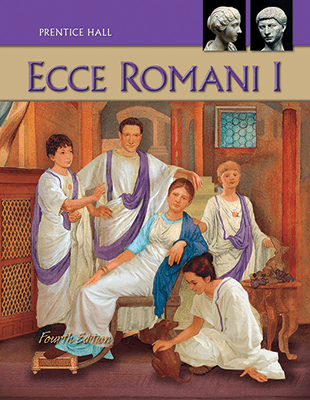 A Call to Conquest contains all the readings on the Advanced Placement® Latin Examination from Books 1, 4, 5, and 6. In addition, the textbook includes all the required readings in English from Books 1, 6, and 7, using the translation of S.A. Handford, published by Penguin Classics as The Conquest of Gaul. The Latin text includes macrons and is set in a highly legible font. The textbook provides several features designed to help students become more proficient at reading Caesar’s prose: suggestions for effective reading in the introduction, special Reading Strategy sections correlated with the Latin text, and a summary of Latin syntax. Facing notes provide glosses for unfamiliar vocabulary, additional help with difficult passages, plus historical and military background. Each section of Latin reading is accompanied by comprehension questions to assist students on their first approach to the text, and discussion questions appear at intervals throughout the book. The introduction provides an overview of Caesar’s life and works, information about the Roman army, and a glossary of figures of speech and rhetorical devices. Also included are introductions to the individual books, illustrations, maps, charts of Latin noun and verb forms, and a Latin to English vocabulary. The Student Companion Web Site, accessed at PearsonSchool.com using a Student Web Code, features links that connect students to more information and resources related to Caesar’s Gallic Wars. Accompanying A Call to Conquest is a Teacher’s Guide with extensive discussion and teaching tips, literal translations of all selections, answers to the comprehension and discussion questions, and sample questions in the AP® format. The Teacher’s Companion Web Site, accessed at PearsonSchool.com using a Teacher Web Code, includes a variety of online resources bibliography, vocabulary frequency list, text enlargements, and links to other online resources to enhance teaching Caesar’s Gallic Wars.